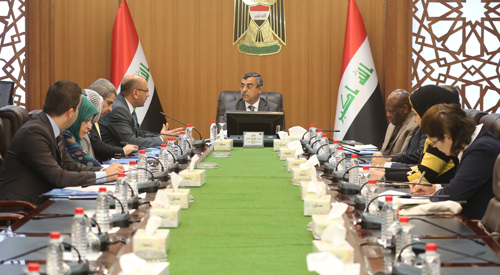 The Secretary-General of the Council of Ministers d. Mahdi Al-Alaq stressed the importance of providing accurate, comprehensive and detailed information about Iraqi women to crystallize national visions to improve their reality away from their role in procreation and child rearing. This came during a meeting of the Supreme Executive Committee of the Integrated Survey of the Social and Health Situation of Women in Iraq, in the presence of the concerned authorities from ministries (Planning and Health), in addition to the Kurdistan Region Statistics Authority and the Women Empowerment Department, in collaboration with UNFPA, Field survey and implementation steps in all governorates. The survey pointed out that the survey will target more than 15,000 households at the urban and rural levels, taking into consideration the population density in the capital Baghdad. It will also focus on the research of indicators that reflect the reality of women's lives across different age ranges starting from 15 years and above, Divorce, early marriage, and other sections of the questionnaire. The participants discussed the possibility of carrying out the survey in a number of IDP camps, in order to obtain comprehensive indicators that cover all segments, especially those that surround women with conditions that have a severe impact on their behavior and public health and enable them to be family, social and political.